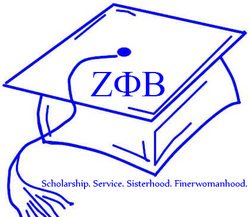 Scholarship Program - Zeta Phi Beta Sorority, Inc. Zeta Delta Zeta Chapter Serving Burlington County, N.J.
Zeta Phi Beta Sorority, Inc. has based its foundation on the ideals of Scholarship, Service, Sisterhood and Finer Womanhood. In accordance with these ideals, Zeta Delta Zeta has made a commitment to assist young women in Burlington County who are pursuing higher education by providing academic scholarships. The scholarships that are offered include the Cl﻿ara Bennett ﻿Scholarship, Estelle Rice Scholarship, ﻿Glenda Wilson Scholarship and the ZDZ Archonette Scholarship and range from $1,000.00 to $2,000.00. Click HERE to access our scholarship application for 2019. Scholarship payments will be made out to the recipient once proof of enrollment at the college or university is received. The scholarships are open to Female High School Seniors who reside in Burlington County OR have been a member of the chapter’s Archonette youth auxiliary for two preceding years. Applicant must have applied for acceptance to an accredited two or four year college or university as a full time student. NOTE: Two year college recipients are eligible for $1,000.00 only. Four year college recipients are eligible for $1,000.00 to $2,000.00. Applicant must have earned at least a 2.5 grade point average on a 4.0 scale. Applicant must have a demonstrated need for financial assistance. Applicant must have participated in community service events, have a firm academic foundation and demonstrated leadership in extracurricular activities. Applicant must include a copy of a photo ID or photograph. Applicant must provide college or university acceptance and enrollment letter to receive funds. Applicant must provide an official high school transcript including the 1st marking period of 12th grade. Applicant must provide two (2) signed letters of recommendation that will provide information confidentially about their character and/or financial need. One (1) letter must be from a teacher, advisor or guidance counselor and the other (1) letter may be from work, church or a community affiliation. NOTE: The application will be considered incomplete if the signed letters of recommendation and high school transcript is not received. Awardees will be notified on or by Sunday April 21, 2019. Awardees must be present at Zeta Delta Zeta’s Annual Awards Ceremony, which will be held on Sunday May 19, 2019 at Tabernacle Baptist Church, Burlington, New Jersey to receive their certificate and letter of scholarship intent. If you have any questions regarding the scholarship application process, please contact us at 2vpzdz@gmail.com or call 732-672-0895.